The St. Louis Regional Chamber honored SIUE’s Eugene B. Redmond Learning Center in February with its inaugural Arcus People’s Choice Award. The Arcus People’s Choice Award, sponsored by RubinBrown LLP, was one of 11 honors that the Chamber bestowed on the region’s top leaders and companies for helping make St. Louis a more attractive place to live, work and invest. The Center won as a result of receiving a majority of the popular vote from individuals across the region. The Center is named in honor of Dr. Eugene B. Redmond, SIUE emeritus professor in the Department of English Language and Literature, author, editor and Poet Laureate of East St. Louis. The Center fosters creativity, encourages scholarship, promotes diversity and exposes the region to multicultural poetry and the Black Arts Movement. It has attracted national supporters including Maya Angelou, Nikki Giovanni, Toni Morrison and Tavis Smiley. The Center houses Redmond’s collection, which is comprised of more than 60 years of chronicling of the artistic world and cultural history from around the globe, and photographs and works of poetic legends and other noted wordsmiths. SIUE’s Library and Information Services acquired the sizable and impressive collection from Redmond, co-founder of the Eugene B. Redmond Writer’s Club, founding editor of Drumvoices Revue, East St. Louis Poet Laureate and affectionately known as “EBR.” Redmond’s collection has a unique historical record of African American and multicultural arts movements and integrates research in the fields of art, folklore, literature, poetry, history, dance, music, drama, photography, diversity and culture. “To have a home for all the many sundry and varied things that I have come across and often held onto for more than 60 years is too wonderful for me to grasp,” said Dr. Redmond. The collection covers from the impact of Emmett Till and Rosa Parks in 1955 until the present. The Collection and Learning Center contains three rooms. The reading room displays many of Redmond’s collections and artifacts and those pieces will be rotated on a regular basis. A workroom houses special collections that will be digitized in coming months. The teaching room is equipped with 24 computers, a smart board and a state-of-the-art podium. The idea of the Center germinated with Howard Rambsy, PhD, English language and literature associate professor. “I first visited Professor Redmond’s home in 2003. I was walking up the steps to the second floor, and I froze when I saw the photo of Sonia Sanchez and Toni Morrison touching heads,” Rambsy said. 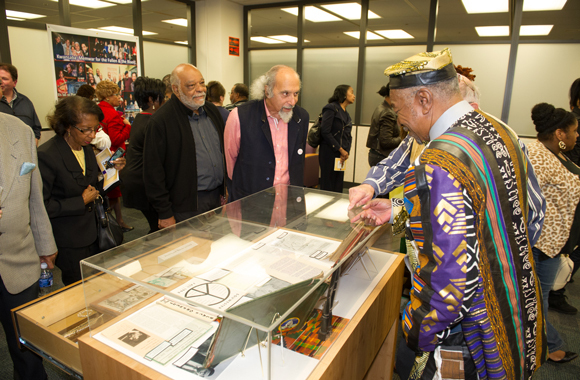 “I said we have to do an exhibit of your collection and work.” Rambsy first learned about Redmond's research and writing on African American poetry in 1997 and came to the University for the sole purpose of being able to work with Redmond. Rambsy and Redmond worked together to form the Eugene B. Redmond Collection and held its first public exhibit in February 2004. Redmond is also an award-winning author/editor of several dozen books, journals and anthologies. As Literary Executor of the estate of Henry Dumas (1934-1968), and in collaboration with writers such as Amiri Baraka and Toni Morrison, he has edited several volumes of Dumas’ works. The SIUE Eugene B. Redmond Learning Center celebrated its grand opening in October 2015.